Each year Russ Ford, who was one of the major catalysts of the Cape League, is honored by awarding the most outstanding relief pitcher of the season the recipient of the Russ Ford Award. Ford dedicated four decades of service to the CCBL as a former Cape League president (1978-83) and anchor of the Orleans Cardinals franchise. Two years ago, the only person who may have thought Kevin Whelan would have been receiving a pitching award the most prestigious summer baseball leagues in the nation, may quite possibly have been Kevin. Having played catcher his whole life, Kevin took the opportunity of playing in the Jayhawk League and turned his life around after having a disappointing showing at the plate. Whelan asked his summer coach if he could throw a little from the mound, and having the powerful arm that he does, he blew not only the Jayhawk League away, but got caught the attention of scouts and his coach at Texas A&M. Expecting a relief spot on his school team was not what Kevin found when returning to Texas A&M for his 2004 season. Instead he found himself behind the plate, due to injury of a fellow catcher. In his last season at school, Kevin had a somewhat disappointing year at bat and pitched only a very few innings for the Aggies. At the end of an upsetting ride, Kevin was anxious to get to the Cape. He held his head high, hoping for the best, and that's just what he found. John Wylde, President and General Manager of the Gatemen said that "we had all intentions of using him as a pitcher." Kevin's attitude to keep going no matter what helped him to establish himself with an impressive 11 saves, on his season of Cape League play with the Gatemen. Kevin made a spot in the Gatemen record books, having the second most saves the Gatemen have ever experienced inside their ball club. 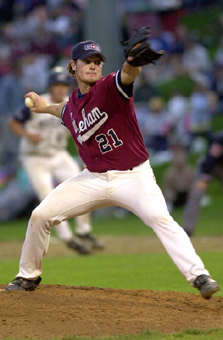 Whelan was a powerhouse throwing consistently in the mid 90's and was a real go-to man for the Gatemen in the 2004 Cape League Season. "He came off of a very disappointing season with Texas A&M but his summer really blossomed into something wonderful" said John Wylde. In the last game for the Gatemen, Kevin caught eight innings, collecting a double to improve his batting, and came into the ball game in the 9th inning for relief, closing the game for the Gatemen. Wylde had nothing but good things to say about his team's success story. "It truly is a rags to riches story. I honestly feel that Kevin Whelan is one of the few who will have a lasting impression on many scouts this summer. He is great in all aspects. He helped out with the clinics, he has a great personality, and he always has a smile on his face." Making it seem so effortless, Whelan faced 74 batters in 21.2 innings and kept his ERA to an eye popping 0.42 on the season. But what truly caught the eye of coaches, and league officials was the fact that Kevin could enter a game, no matter what the situation and pull it out for the Gatemen, which is obvious in his record setting 11 saves. Having nothing to lose and everything to prove, Kevin Whelan showed up ready to play and along the way established that he was great. Leaving this summer with a few new pitches he learned from his pitching coach gave strength to an already distinguished powerhouse, which not only makes Kevin a very bright prospect, but clenched him the Russ Ford Award, for most outstanding relief pitcher. While The Russ Ford Award may be one of the most prestigious awards the Cape League has to offer, it seems only fitting that it go to someone who has battled so hard never giving up.